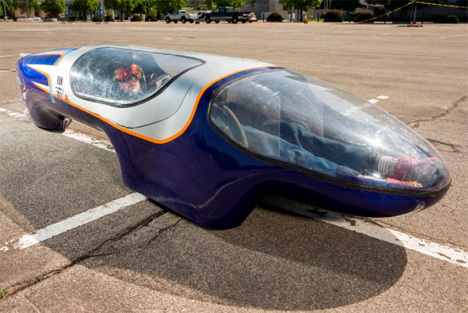 You would never expect a car that has a top speed of 25 MPH to win any contests, but the BYU Supermileage Vehicle was built to win the SAE Supermileage Competition 2013. The odd-looking car weighs just 99 pounds and can only accommodate one person, who has to drive lying down. But the most striking feature of the car, by far, is its gas mileage: well over 1000 miles per gallon. 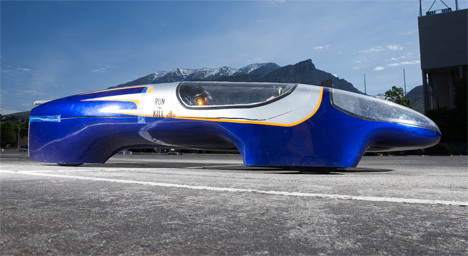 In 2012, BYU’s entry reached 1135 MPG, but this year they focused on making the car lighter and more aerodynamic. They shaved 22 pounds off of their 2012 model by reassessing and retooling every aspect of the vehicle. During the competition, each car receives 20 grams of fuel and is then driven around a 10-mile track. The remaining fuel is measured after the course to determine how much fuel was used. This lets the judges determine the miles per gallon rating that each car is capable of. Will we see super-mileage vehicles like this on the road soon? Not likely, but it’s comforting to know that there are some people out there working on the science of making filling up at the pump a slightly less painful experience.